At Bella Care Hospice, one of our goals is to inform the public about what hospice is….and what hospice isn’t. Hospice is a set of services that we all may need someday -- if not for ourselves, for our parents, friends, neighbors, or other loved ones. While death is not an option for any of us, we do have choices about the services we use at the end of life. Hospice is undoubtedly the best option in the last months of life because it offers a whole variety of benefits, not only to those of us who are dying, but also to those we leave behind. Yet, despite its many advantages, hospice is still a mystery to most Americans, 25 years after its introduction to this country. That hospice remains a mystery is due in part to our society’s resistance to discuss matters related to death. Also, the general public has many misconceptions about what hospice means. Now, more than ever, there is a sense of urgency to dispel the myths and to learn as much as possible about hospice. While those affected by terminal illness struggle to come to terms with death, hospices gently help them find their way at their own speed. Many hospices welcome inquiries from families who are unsure about their needs and preferences. Bella Care Hospice staff is readily available to discuss all options and to facilitate family decisions. Below is a list of common questions and answers about hospice services. Hospice is a philosophy of treatment that provides humane and compassionate care for people in the last phases of incurable disease so that they may live as fully and comfortably as possible. This care is provided by a team of professionals which include: a physician, nurse, social worker, chaplain, nursing assistant and volunteer. This team works with the patient and family to manage pain and other symptoms that may arise during the final phases of a disease process. How long can we have hospice? According to the Medicare hospice program, services may be provided to terminally ill Medicare beneficiaries with a life expectancy of six months or less. However, if the patient lives beyond the initial six months, he or she can continue receiving hospice care as long as the attending physician recertifies that the patient is terminally ill. Medicare, Medicaid, and much other private and commercial insurance will continue to cover hospice services as long as the patient meets hospice criteria of having a terminal prognosis and is recertified with a limited life expectancy of six months or less. Despite this fact, most patients are not referred to hospice until the last week of life! You do not need a physician referral to discuss hospice care, so if you or a loved one wants to explore this option, just give us a call! Do I need to have pain to use hospice? Absolutely not! Hospice is also about addressing fears, financial concerns, family matters and celebrating life! Our goal is to be an advocate for the patient and to help them have the best days possible. Hospice means that we have given up hope. When death is in sight, there are two options: submit without hope or live life as fully as ever until the end. The gift of hospice is its capacity to help families see how much can be shared at the end of life through personal and spiritual connections often left behind. It is no wonder that many family members can look back upon their hospice experience with gratitude, and with the knowledge that everything possible was done towards a peaceful death. It is beneficial to the family and patient to make referrals to hospice as early as possible so that relationships can be developed with the care team. This way, those relationships will already be in place before any “tough” situations arise and the patient/family can bet better served. 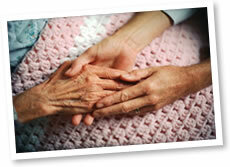 Hospice involves acknowledging that many diseases in their advanced form cannot be cured. It does not mean that a patient is giving up hope. Hope is found in helping the patient and family achieve the highest possible level of physical comfort and peace of mind. Sometimes coming to the point of “being ready” requires some help from hospice. Hope means different things to different people. The goal of hospice is to walk by the patient’s side during this process and help them live out what hope means to them. Most people who use hospice are over 65 and are entitled to the Medicare Hospice Benefit. Bella Care Hospice will cover all medications, supplies and equipment associated with the hospice diagnosis – with no out of pocket expense to the family. This includes incontinence supplies and supplements. This means that there are no financial burdens incurred by the family, in sharp contrast to the huge financial expenses at the end of life which are incurred when hospice is not used. As a family-centered concept of care, hospice focuses as much on the grieving family as on the dying patient. Most hospices make their grief services available to the community at large, serving schools, churches and the workplace. Hospice is one of the only medical benefits that address the needs of the patient and the family! Hospice is just for cancer patients. Hospice is for anyone who has a disease process where a cure is not possible, or the process of managing the illness has become too much of a burden for the patient. Such illness include: Alzheimer’s/Dementia, Cardiac Disease, Lung Disease, AIDS, Stroke, Cancer, Neurological Disease, Renal Disease and Liver Disease….just to name a few. If you think that you or a loved one can benefit from hospice care, please do not hesitate in calling us. We recognize that losing a loved one is sad. However, at Bella Care Hospice, our goal is to celebrate life and to help our patient/families have the best days possible. Many of these days are filled with love, laughter and happiness.